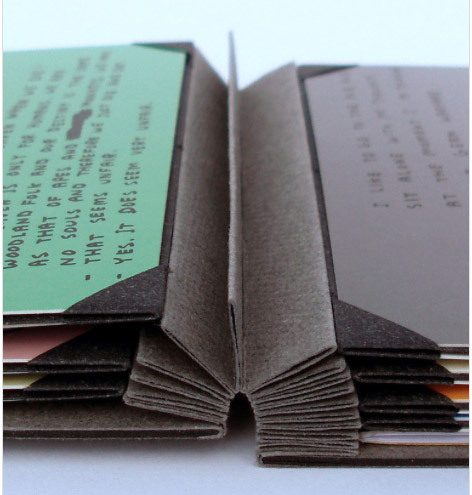 Boven Kamers is a collaborative Dutch pop-up book between neuroscientist Gerard J. Boer, professor Harry B.M. Uijlings, paper artist Ingrid Siliakus and graphic designer Moon Brouwer. 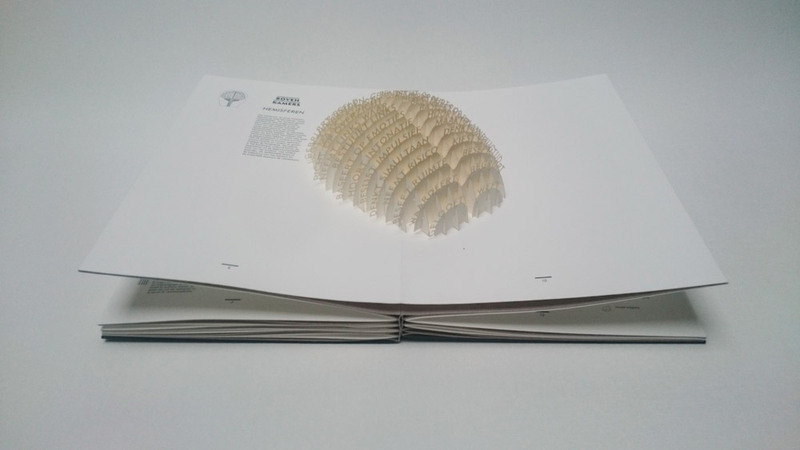 The book contains a total of six laser cut pop-up spreads which send the reader on a tour through the human brain and its functions. Printed in a limited edition of 50, each book is numbered and signed. Ben Elbel‘s innovative rebinding of this book was just completed earlier this year. I have been waiting in anticipation to see this binding after you spoke to me about it. In your newsletter on this binding, you mention that the compensation folios are sewn together. The spine opens to a sharp ‘V’ allowing the pages to lay flat, can you elaborate on the sewing structure and any treatment done to the spine? 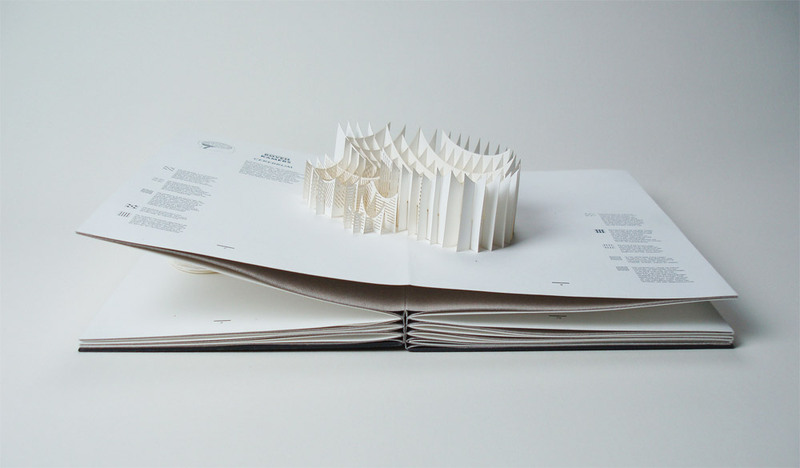 Boven Kamers (literally means upper rooms in Dutch, a colloquial expression meaning brain), is an exploration of the human brain in the form of a pop up book, by the young Dutch designer and publisher Moon Brouwer. I was commissioned to re-bind the book by the Dutch Royal Library (The Hague). When I first received it, the book presented itself as a series of folios laminated with one another, each folio containing a pop up. A hard cover was provided but disconnected from the textblock. Technically, the challenge was to provide compensation for the pop-ups as well as a perfectly flat surface for them to smoothly unfold, all of this without sewing and without introducing blank pages between the folios. After some research I concluded that none of the existing binding structures (traditional or contemporary) were quite suitable to do all this, so I created a new one from scratch. It took about a year and the result is a series of ‘T’ elements made from heavy paper, sewn with one another. The folios are inserted between each T and secured only at the fore-edge. On the next images one can see how the spread ‘floats’ on top of the binding, allowing the pop up to fully unfold. The original cover was mounted at the back of the book and a lettering was created, on the spine and front board, to evoke a kind of staircase leading to the upper rooms. You can read a bit more about the binding and see some images of the book at various stages through the design process here. Ben and I have kept in contact ever since he embarked on offering online courses (more on that in the interview). His work and business ethic are quite inspiring as Elbel Libro has expanded beyond the traditional bindery. He ceases to amaze me with his sleek designs and innovative binding structures. There seems to be no stopping his creativity. Check out the interview after the jump and make sure you come back during the month of July for even more probing questions regarding a selection of Ben’s work. You can get email reminders by subscribing to the blog, just click here. Let’s start at the beginning, where did your interest in bookbinding start and what type of training did you receive? My first contact with bookbinding was an introductory course that was part of my training as an illustration student in Strasbourg (France). It was basic but enough to quickly turn me into a keen adept! While still an illustration student I took further training at the city archive where the head of conservation, Bernard Santoni, kindly agreed to let me come in once a week for a year to give me private lessons. In 2007, I graduated from art school and briefly attempted —not very successfully— to earn a living from my drawings. At this point, despite my near addiction to it, I hadn’t yet considered bookbinding as a career. It was my Dad’s suggestion and also his idea that I should get further education, and so I went to the Centro del bel Libro in Ascona, Switzerland. I studied there for a year, taking various practical and theoretical classes on conservation with Henrik Roerig, bookbinding with Edwin Heim and specific subjects with guest teachers such as Hedi Kyle, Markus Janssens and Barbara Hassel. After Ascona I moved to Germany to work at ‘Die Buchmanufaktur’ run by Claudia Flade. Then two years later to London where I worked for another 3 years at Shepherds Bookbinders and briefly at Book Works. And since then I have been self employed, I receive training every day from working for my clients! Can you describe your business and what type of services you offer? How has your training and prior experiences shaped your business? 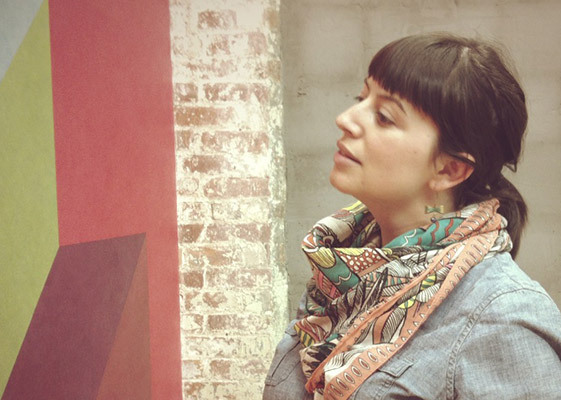 I work with my girlfriend Kieke and we offer bookbinding services and resources to other binders. When discussing a job with a customer, there are certain specs that are being agreed on, such as sizes, material, colours, etc. But there is also a fair amount of choices that are usually left to the binder such as board thickness, board quality, width of squares, the way to tuck in a corner, etc. These details are not immediately visible, but they are where the devil really lies and constitute the ‘touch’ of a binder. The touch is something very personal. It is the sum of a binder’s training and prior experiences, but also his/her personality, and is something that can make a real difference. I like to think that people use me because I am able to do what they need, that I strive to do it on time and at a reasonable price, but also because they like my touch. I’m happy when I get some really tricky stuff such as complicated boxes or a very challenging pop-up book, but I also enjoy simple binding jobs from time to time or volume work (ex: menus) where the challenge is to devise processes to accelerate the production. For this it really helps to have worked for commercial binderies in various countries and collected precious tricks of the trade. The second half of what we do at Elbel Libro is helping other people live their passion for bookbinding by offering workshops and a number of resources and products available through our online shop. One of the products which I’m most proud of is our collection of printed tutorials. We put a lot of effort into finding the best way to explain an action, by deciding whether it needs one or more photos, a paragraph or a whole page, and tweaking the copy until it’s 100% clear. For this I use my experience in teaching, but of course my background in illustration/communication really helps. We print them in 3 languages and always try to include a few jokes. For example, our onion binding tutorial contains a recipe for french onion soup. I’m proud of these tutorials because I think they reflect best on who we are and what we want to do. Most recently you’ve relocated your bindery business to Amsterdam. Having also worked in binderies in Germany and England, what similarities or challenges have you experienced working throughout Europe? Working in different countries has had an extremely enriching experience. In Germany I learned a lot of tricks of the trade that are useful to speed up work because the Germans are very strong in lean manufacturing. In the UK I was introduced to the ‘trial and error’ approach. When unsure of the outcome of an action or a process, the English tend to go ahead and learn from the results (‘there is only one way to find out’, as they say), rather than sitting down and thinking about everything that can go wrong. I like this bold approach and I found that trials produce success more often than error. Bookspots is a worldwide directory of shops, museums and places of interest to bookbinders. What drove you to create such a resource? The idea came when we were in London; quite regularly we received visitors from abroad, fellow binders, and they always asked us for shops and museums to visit related to bookbinding. We tend to do exactly the same when we travel. I love to bring back a unique decorated paper or a tool that I can’t find anywhere else etc. So over time we accumulated quite a wealth of addresses and we thought it might be of interest to the community to share these tips in an online directory. We encourage people to share their tips with us, which we then add to the resource. Your presence in the bookbinding world has expanded globally through the online courses that you offer. Can you talk about how you went about developing this idea into the experience it is now? I owe that to you, Erin! You were the first person to be adventurous enough to try it out with me. The things I have improved since then are the lighting on my side which can be challenging when doing a long session and using natural light. I also switched from Skype to a more reliable, paid service and now we don’t loose connection any more. I also changed the way I offer them. I now have a limited number of dates throughout the year that people can sign up to, rather than arranging times to suit people. Your online workshops can vary from a single participant to multiple participants. Does a larger group offer challenges over teaching a single student? With the platform I’m using now I can teach up to 4 students, with each one of them being in his/her own space behind his/her own computer. With a limited number of students I can really give each student a lot of attention. The experience you organized for me at North Bennet Street School was a bit different. All the students were together in the same classroom and they could see me and my demos via a projected image on a screen. It wasn’t possible for me to help each student individually because the camera wasn’t moving and I could only see the whole classroom, so we needed a person to act as a coordinator (which was you, Erin) and check on people individually. I think it did work, although I remember thinking that actually it would have been easier to teach you individually and let you teach the group later on, without me being present! I first met you through an online workshop* where you taught one of your innovative structures “The Shrigley”. You’ve developed a variety of structures, can you walk us through the process of engineering a new binding style. My first teacher Bernard Santoni was influential in making me feel free to develop my own ways of making things and later when I met great inventors like Hedi Kyle and Daniel Kelm it just reinforced the idea that this is what bookbinding is all about. Engineering a new binding style is a quest for personality, regardless of the decoration, but there is another element to it which is the joy of experimenting. *You can read about the workshop I took with Ben here. Fantastico! Ben è un mito! Ben is an intelligent and brilliant binder, and a generous and superb teacher. Thank you for sharing.